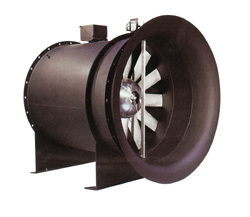 Products : Chicago Blowers : Design 47 Controllable Pitch Vane Axial Fan - Draft Air, Ahmedabad, Gujarat, India. Chicago's Design 47 Vane Axial Controllable Pitch Fans respond automatically to signal source based on changes in temperature, humidity, air flow, gas concentration and air quality. While low initial cost, simple installation and operation make the Design 47 the best choice for variable air volume systems, they are also used in industrial applications to maintain constant environmental conditions regardless of air demand. Fan Sizes 16-1/2" to 81-1/8"